You live in a connected world where smartphones help you exercise, navigate, communicate and more. To easily access your phone wherever you go, you need a versatile mounting system that attaches and detaches the phone with no effort, and keep it securely mounted in place even under the most demanding conditions. The FitClic Neo is such a system. It is the worlds first magnetic twist-locking system for smartphones. Thanks to a smart combination of small magnets, FitClic Neo is nearly 4 times easier to use and 2.5 times more secure than similar mounting systems in the market* while leaving intact the phones most critical functions**. All you need to do is to place your FitClic Neo phone case or U-TAG near the mount, and the system will do the rest like magic. Once locked, the only way to release is to rotate the lever on the mount, and all can be done with only one hand. 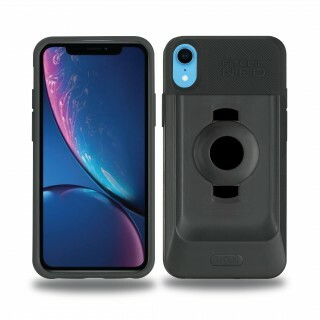 This Kit contains 1 FitClic Neo case for iPhone XR and 1 Bike Strap Mount. Fits bar within Ø25.4-31.8mm/1"-1¼ "
* Based on a study on 8 common phone-specific mounting systems in the market comparing the total time required to successfully attach the phone case on the mount as well as the maximum force the system can resist before sending the phone to the ground. ** These include the storage and access of data, all wireless communication functions, and the compass. Inductive wireless charging might be hampered. For more information on FitClic Neo NEW mounting system, click here.